If their debut album Pickin’ Up The Pieces was inspired by a Motown sensibility, then More Than Just A Dream has the LA-based sextet shimmying into the ’80s and ’90s. The allure of Fitz And The Tantrums continues to orbit around the saucy dynamic between co-vocalists Michael Fitzpatrick and Noelle Scaggs. Producer Tony Hoffer (Beck, M83, Foster The People) should be commended for polishing the band’s sound. Singles like “Out of My League” and “The Walker” are danceable hits with staying power. The addition of synths and hip-hop backbeats to the classical hooting vocals makes it clear that Fitz And The Tantrums are trying to expand beyond the confining purview of “token retro band.” However, despite the noble intention and unbridled gusto, there seem to be one too many misfires. 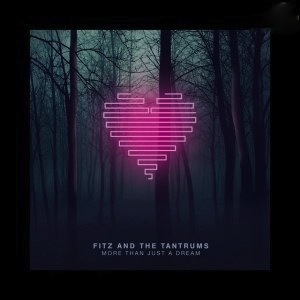 In trying to turn every single into an anthemic ballad—an ambitious feat—Fitz And The Tantrums demonstrate a woeful lack of direction that ripens into chaos by the album’s end. Unlike other pop songs with hackneyed bars and tired vocals, Fitz And The Tantrums face a graver problem: rather than being addictively catchy, they are instantly forgettable.